What is Heat Loss Factor in Actual Cycles? We have discussed the Air-standard cycles and the actual engines such as the spark-ignition and compression ignition engines. But the efficiency of these actual cycles is always less than the air-standard cycles. We have discussed the comparison between the Air-standard cycles and the Actual cycles and listed the most influential factors such as the Time Loss Factor, Heat Loss Factor, Exhaust Blowdown Factor. In this article, we are going to discuss the Heat loss Factor. In the IC engines have four operations, suction, compression, combustion and expansion/exhaust. among those, the Heat loss will occur during the Combustion and the expansion strokes. Heat loss during the combustion process definitely has a high influence on the cycle efficiency whereas the heat loss during the end of expansion stroke will have effectively less influence on the cycle efficiency. During the combustion process in the IC engines, the heat flows from the cylinder gases through cylinder walls and cylinder head into the cooling fins or water jacket. The heat also loses from the piston head into the piston rings carried away by the lubricating oil or flow through the cylinder walls into the water jacket. 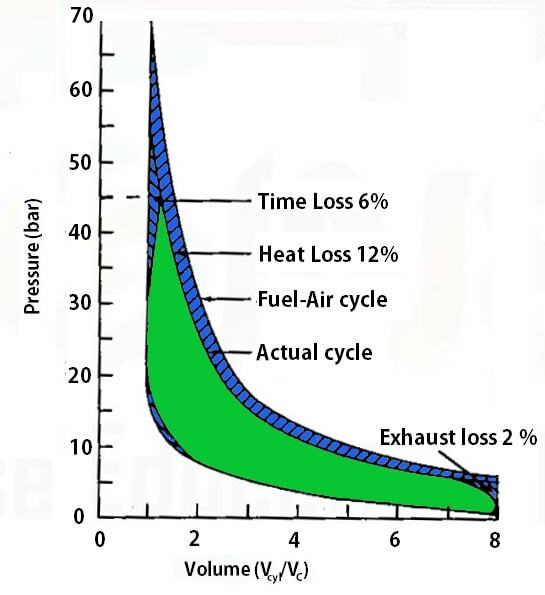 The above diagram shows all the three different losses, Time loss – 6%, Heat Loss – 12%, and the Exhaust loss 2% are determined on a Cooperative fuel research Engine (CFR Engine). One important thing is that In Air-standard cycle also it is assumed that, not all amount of heat can be converted into work. Only a certain amount of heat input will be considered as converted into useful work. The rest is rejected under the expansion stroke. 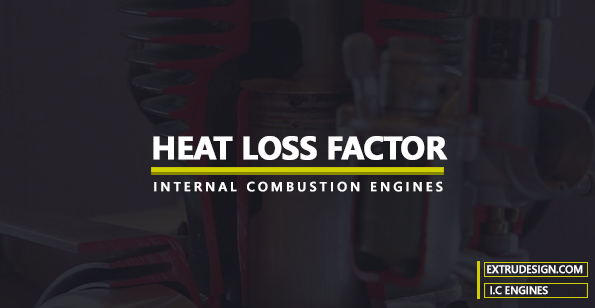 We have discussed the Heat loss factor in the actual engines along with the different factor of heat loss. If you have any further thoughts about this topic, let us know in the comment section below.